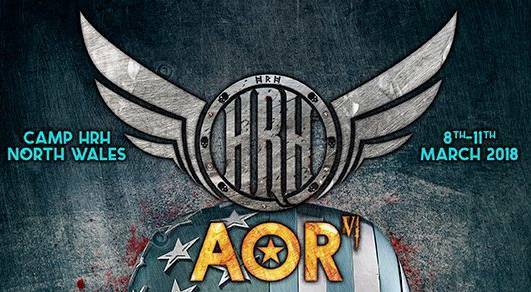 Review: HRH AOR 6 – Day 2 – Rockposer Dot Com! After an exhilarating opening night we move onto the first full Day of the Festival with an extremely busy lineup there was a lot to get through. The day begins with some short Acoustic sets for VIP/Royalty attendees down beside the Media Area, which I was unfortunately unable to attend, then followed by a full day on both stages. The first day was being kicked off by Glasgow’s The King Lot. Again, with these guys, I haven’t heard any of their recorded output. However, I was impressed with them at Winterstorm last year and wanted to make sure I checked them out again. While hardly being an AOR band, they ply a brand of muscular melodic hard rock that I find very appealing. They rattled through their set of with some huge razor sharp guitar riffs and even bigger choruses. They are a three piece with bassist Jason Sweeney picking up lead vocals ably backed by the other two. The great lead vocals were matched by a band tighter than Rob Evan’s wallet! I have heard these guys compared to Gun due to strong hooks in the chorus but they reminded me a little of Kings X at their melodic best. They are clearly doing something right as the main hall was very busy for an opening act and they went down a storm and the hall emptied considerably for the next act. Swedish Rockers CRUZH take to the stage looking like they mean business, having seen them in the UK last year I knew they were itching for a chance to show what they can do again. and they push hard from the start. Fronted by Philip Lindstrand the guys look a little more sleazy than they actually are. Damn can he belt out the high notes, and although I still find it slightly odd that Tony (who sang on the album) didn’t take up the vocal duties as he also has a great voice, it all seems to be gelling nicely now, Dennis (Bass) has a larger than life stage persona and it’s very difficult to take your eyes off him as he commands attention, great to watch. This is a band with a lot of talent and really look forward to seeing where they take their music next. Highlight`s today for me are ‘In And Out Of Love‘ and ‘First Cruzh‘, These guys will no doubt be back soon with some new tunes. Terrific set, COP UK are visually brilliant, another high energy performance, as I’d expect from Dale and whoever else plays in this band. They just draw the audience into their performance. And a very healthy audience it is at the 2nd Stage, even though we are approaching evening time and bellies were no doubt starting to rumble. Crimes Of Passion for me have always sat on the boundaries between Melodic Rock and Melodic Metal, and they have released some cracking albums, as with many festivals they have limited time for their set today and personally I’m sad not to hear ‘Kiss Of An Angel‘ in the set, but that’s just because it’s a great song, but there’s plenty more on offer today. ‘Lover Is To Die For‘ is great and ‘Catch Me If You Can‘ sounded great, it’s a pacy and punchy rocker, lots of fun in the eight tracks on offer and Dale the showman thrives when you put him on a stage in front of a crowd. Have always felt they are an underrated band, and judging by the comments of some people wandering into the 2nd Stage area this set has gone down very well. Also thrown in is a cracking version of Journey’s ‘Separate Ways‘, great to see them again and hope they added some new fans to the club this weekend. Next up for me was Daylight Robbery. Last time I saw these guys was in 2013 at the inaugural HRH AOR. However, since then and the album released in the same year, I am not aware of them having done anything. I thought, it was a strange decision having them on third on the bill and clearly the punters thought so too as the hall emptied considerably. The guys have some good material and Tony Nicholl has a great voice and they have a great guitarist in Mark Carleton. However, whilst tight and fairly polished their set left me a little underwhelmed. For me there was just something missing which is possibly due to lack of gig time and there was no discernible improvement since 2013. The crowd they drew appreciated them regardless, so what do I know! Had been really looking forward to seeing Iconic Eye again, with the band now fronted by Jane Gould and liking what I’d heard to date of the recorded material with her, and they did not disappoint. Jane’s vocals are excellent throughout, Greg (Guitar) is the keystone that everything is built on, Mike (Bass) and new drummer Jon are really solid already and then there’s the energy ball that is Robin Mitchard (Lead Guitar) who not only plays great but is a visual dynamo, great to watch, this lineup of the band is working so well together and you can feel it from the crowd. This is one of the bigger crowds that I saw on the 2nd Stage over the weekend, and they were duly entertained. The beautiful and very personal ‘Black Country Lady‘ spotlights Jane’s vocals and it definitely tugs at the heart, the tracks from last years ‘Into The Light‘ release all cane across really well and look forward to catching them properly again soon. Having heard quite a lot about of Jac Dalton in recent years It was a pleasant surprise to see him on the lineup for HRH AOR this year, especially having liked the ‘Icarus‘ album, but it was the title track from the previous album ‘Powderkeg‘ that really kicked things off nicely for this set, cracking song, the band were really up for the show and they play no apologies Rock, have to say ‘Powderkeg‘ is the standout for me alongside the kicking closer ‘Locked Crocked‘ , but it’s a really good set all around. The band sounded really tight and worked very well with each other around Jac, who commanded center stage like great boxer. This set may well have pushed a number of people to go check out Jac Dalton, and he would be another welcome return visitor at some point. What can you say about this band that we haven’t already said the last couple of years, what a wonderful bunch of guys, still with the most amazing Harmonies, they love being on that stage and truly appreciate their audience and anything they get back with regards a positive reaction. To be honest I think they would stay up there all day and night if they were allowed. This evenings set is introducing people to some of the songs from last years ‘Unstoppable‘ album along with what have now become classics. Of course alongside the music the onstage banter has been great entertainment for HRH AOR audiences, Jason Old and Steve Janevski have a brilliant chemistry alongside their undoubted talent as musicians. Although it was sad to say goodbye to Rob and Ben this year we welcome Ant (Bass) and Gill (Drums) to the band and they have fitted in so well in a relatively short space of time. This year I had promised to be more focused when I got into the Pit to shoot the guys, but just like last year involuntarily I started singing while I was shooting, but I did try not to, just can’t help it love their music and sound, with tracks like ‘Tell Me What You Want‘ kicking things off honestly I stood no chance, it’s so upbeat and demands you sing along to it, this band could bring a smile to Darth Vaders face, there is so much to enjoy, whether it’s Steve’s screaming solos, Jase’s cheeky delivery or those stunning harmonies, truthfully it is the repeat band I never mind being added to the bill each year, they are a joy to see, to shoot and to meet. The new tracks blend in well and ‘You’ve Got The Touch‘ even though it’s a slightly slower pace but again those bloody harmonies are sublime. It may be obvious how much I love these band, but that doesn’t mean they aren’t great, the set is well balanced, but somethings you just gravitate towards the faster more upbeat tracks, and the end of the set is blinding, ‘World’s Gone Crazy‘, ‘Broken‘ and then into their wonderful cover of Andy Taylor’s ‘I Might Lie‘ leads into a blistering version of ‘Can’t Get You Out Of My Head‘, brilliant set – roll on their next visit. My main question for the next act I was reviewing was basically who the hell are you? Aaron Buchanan and the Cult Classics – sounds like a tribute band. Right from the off it was clear they were another of the bands that in no way shape or form fit into the AOR category. However, what a find they were. Playing raunchy, grungy, melodic rifftastic songs, Mr Buchanan got frontman of the weekend from me. Strutting his stuff like a manic cross between Freddie Mercury, Mick Jagger and Wilko Johnson he commanded the stage with great energy and comfort. And even better he has a great set of pipes on him. Covering most of the stage and a fair bit of the front of the audience with his crowd surfing including hand-stands during the crowd surf, he was a revelation. The band just let him get on with it and cranked out some great songs and I will have to research these guys some more. Surprise band of the weekend, even if not fitting the genre! Some bands just show up at Festivals, play their set and disappear off into the darkness, that’s not how the BulletBoys do things, they absolutely smashed it right out of the gate, this is how to attack your set, just powerful and a great attitude, still think the band are more suited to Sleaze/Glam, but they were determined to make a stamp on AOR. Marq Torien is a great frontman, bursting with energy and just the right level of theatrics to bring a show alive, and he’s ably helped by the equally enthusiastic band, from jumping in unison to bounding around the stage and all to a soundtrack born in smoke filled venues on Sunset Boulevard. But lets not do this band a disservice, they are a damn fine Rock ‘n’ Roll band and Marq has managed to avoid the ravages of time that have hit many of his peers, he sounded great throughout, Chad MacDonald is a beast of a Bass player and fits the part so damn easily, along with Anthony Tiny Biuso cutting an imposing figure behind the kit and Nick Rozz guitar this is very much a band living in the here and now, the title track from the new album ‘From Out Of The Skies‘ sounded great and went over well with the crowd. BulletBoys are another very visual band to watch and they are very polished with it, pure entertainment. The only downpoint for me in the performance was having a drum solo included in what is a relatively short set, should really be a track there for the fans and would have kept high pace up for the whole set. But at the end of the day it’s a minor enough quibble, ‘Smooth Up In Ya‘ was a hell of a way to finish off, really got everyone up on their feet and it’s a cracker of a song anyway. The guys looked like they were having a brilliant time playing and hopefully with this reaction and the rest of the UK dates following the festival we will see them back again soon, Friday evening is turning out to be an absolute cracker. Didn’t have time to catch the full set of Lawless, but what I did see was very good and I’ve always enjoyed Paul Hume taking the front man mantle and the band always put on a good performance, tonight Paul is concentrating on vocal duties and Jamie Crees is the 2nd guitarist. The majority of the set is made up from tracks from their debut album alongside ‘1914 (Ghosts Of No Man’s Land)‘ from 2014’s ‘R.I.S.E.‘ album, and one new track ‘Hour By Hour‘, which although I enjoyed it for me threw the balance of the set off a little. It’s probably more suited to an AOR Festival, but it’s very much a different sound to their previous material. Looking forward to hearing more from the new album. Either way this was another really good set and for those that managed to make a trip across to the second stage while Night Ranger were blowing away the main stage it was well worth it, and those assembled were definitely enjoying what they heard, as always Paul and the band were very appreciative of those that showed up and the reaction they received, hopefully next time around they won’t have such a horrific clash. Ah – the reason I am here and many others it seemed. Night Ranger! They kept us waiting coming on about a quarter of hour late, but it was worth it! Saw these guys three time in the last six years and was fortunate enough to see them in 1986 supporting Foreigner. While like many bands of their pedigree they have some non-negotiable songs in their set, the set has been quite different each gig I have attended in the last six years. They mix in some newer songs from the last couple of albums seamlessly with classics from the first five albums. These included rare outings for ‘7 Wishes‘ and ‘Night Ranger‘. The energy, showmanship and musicianship on show is quite spectacular. In newer guitarist Kerri Kelly they have found the perfect foil for Brad Gillis and the interplay between them is sublime in places. Add to that the superb backing vocals and you have a perfect closing for any rock festival. They even managed to squeeze a little of Deep Purple’s ‘Highway Star‘ into ‘Don’t Tell Me You Love Me‘ before closing with ‘Sister Christian‘ and ‘You Can Still Rock In America‘. Stunning, and worth the trip on their own.